Whatever way you look at it, Samsung has a knack for making product names long and lumpy. Samsung Galaxy Note 10.1 2014 Edition certainly doesn’t roll off the tongue, but if looks are anything to go by, this could be one of this year’s toughest iPad competitors. Sammy’s impressive S-Pen equipped tablet features a beautiful 2560×1600 pixel LCD 10.1-inch display, Cat4 LTE, an 8MP rear camera with 1080p video capture and a front facing 2MP sensor. It’s also equipped with 3GB RAM, a quad-core 2.3GHz Snapdragon 800 series processor and 16/32/64GB of internal storage. It joins T-Mobile’s ranks just after the company announced its ‘Operation Tablet Freedom‘, giving customers LTE tablets at Wi-Fi only prices, and offering up to 1GB of free data each month until the end of 2014. If you want to pre-register your interest, head on over to the placeholder on T-Mobile’s site. Otherwise, site tight, it’ll be landing in stores in June this year. What’s up with this page having more ads then angelfire? Hey man. Raised it with admin. We’re looking in to it. Hopefully with the same deal as with the other connected tablets. Woohoo finally just the tablet ive been waiting on…this is worth paying for! Super Excited! Ive been begging and pleading for some good tabs… THANKS TMOBILE! I think I love you! Yes to removing bloat! Put the applications on when the phone is new to advertise your products but give the ability to take them off. Have them update like regular apps on the OS’s respected application store. Or the ability to deactivate them and make the icons disappear. Add a T-Mobile setting that can let you activate the application again if you want. Keep it from running in the background etc. So does this mean that T-Mobile would get the Note Pro around October? 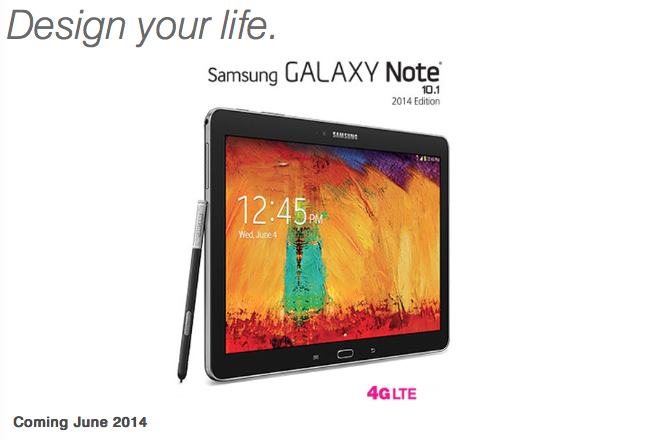 It seems like T-Mobile is getting the Note 10.1 2014 edition a little late to build all of this hype around it. The Note Pro is the one to wait for IMO… Thought this one’s still not a bad tablet by T-Mobile standards. I think that we talked about the Note Pro in another thread. I agree with what you said here, as well. that note pro 12.2 i assume you mean. The huge size could be a downer for some people. The problem with this is I’d rather just have a 13″ ultrabook that’s about the same width and length only slightly thicker and heavier for much more capability. I think the 8.9″ kindle fire is the perfect size for a tablet. Big enough to comfortably use small enough to be greatly portable and not ever be in the way. Not saying the kindle fire is the greatest tho for the price its pretty darn good. Note I own the asus zenbook infinity 13″ ultrabook and a galaxy note 2 and no tablet. I believe in the 5.5″-6.5″ phone + an ultrabook are the 2 best devices to carry. I prefer the 12″ size of the Note Pro and felt that 10″ tablets were too small. I received an iPad Mini as a gift; it is way too small for my preferences. but unless ur going to be walking around and using it while ur physically walking you’d be better off with a 13 inch ultrabook or an 11 inch or 13 inch macbook air. Or if you really must have tablet functionality something like the lenovo yoga that can be both. Anything above 10 inches in a tablet seems redundant to me. It’s only redundant if you have a laptop. I have an old laptop that I won’t replace any time soon because I have absolutely no need or even desire for a laptop. I’d buy a tablet anyway because I actually like tablets. Having a laptop just for the sake of having a laptop would be a waste of money for me. Kind of a old tablet now, I think the wifi model has been out since october but the specs are still completely top notch. I have the wifi verson since December last. Sweet little machine, nothing comparable in market, now updated with KitKat 4.4. You CANNOT go wrong with this. Can’t wait fit Windows to become the next BlackBerry. I’d jump on the Z2 Tablet also but I tried searching online and it doesn’t seem to come with cellular connectivity. At least I couldn’t find the answer. If it is wifi only then T-Mobile wouldn’t make money off a data plan for it. I love my Asus TF700 with the keyboard dock. That extra battery, memory card reader, and usb port really expand functionality of the device. Be nice if they can get a similar product with cellular network. Don’t worry, you got the better tablet because of water resistance. That beats having a slightly better display and a stylus. Where do you see the price?